April 1972 was a month of reckoning for the flight crews of the 374th Tactical Airlift Wing at Ching Chang Kuan AB, Taiwan. US troop withdrawals had begun more than two years before and the war in Vietnam had deescalated back to the level of an insurgency after US and South Vietnamese troops crossed the border into Cambodia in May 1970. The US airlift force in Southeast Asia had shrunk from a level of three wings of C-130s and one each of C-123s and C-7As to only five squadrons of C-130s, and one of those was already in the process of deactivation. US troop levels in South Vietnam had shrunk from more than 500,000 to only some 20,000 men, mostly airmen, as the US role in South Vietnam had declined and the war had become more of a local conflict. The ground war in Vietnam had entered a lull, with few tactical operations, and the airlift role had become mostly logistical. Yet in spite of a massive interdiction effort using fighters and AC-130 gunships to attack Communist supply lines running through Laos, the North Vietnamese had built up a significant force and on Easter Weekend 1972, the Vietnam War suddenly flared up with a vengeance. Communist forces supported by tanks rolled out of Laos and headed down Highway 13 toward Saigon, intending to capture the South Vietnamese capital and end the conflict with a massive blitzkrieg attack. Only one obstacle stood in their way - the South Vietnamese garrison at the town of An Loc where the South Vietnamese military decided to make their stand against the juggernaut that was rolling over them. However, Communist forces managed to encircle the city, thus preventing reinforcement and resupply through ground arteries. The only avenue into the city was through the sky, and the most developed antiaircraft forces yet seen in the Vietnam War made aerial resupply all but impossible. Intense ground fire prevented helicopter resupply so the Vietnamese Air Force turned to it's air transport C-123s. However, several C-123s were shot down and the United States Military Assistance Command directed the 374th Tactical Airlift Wing to begin resupply missions to An Loc. Early on the morning of April 15 three C-130s took off for An Loc. 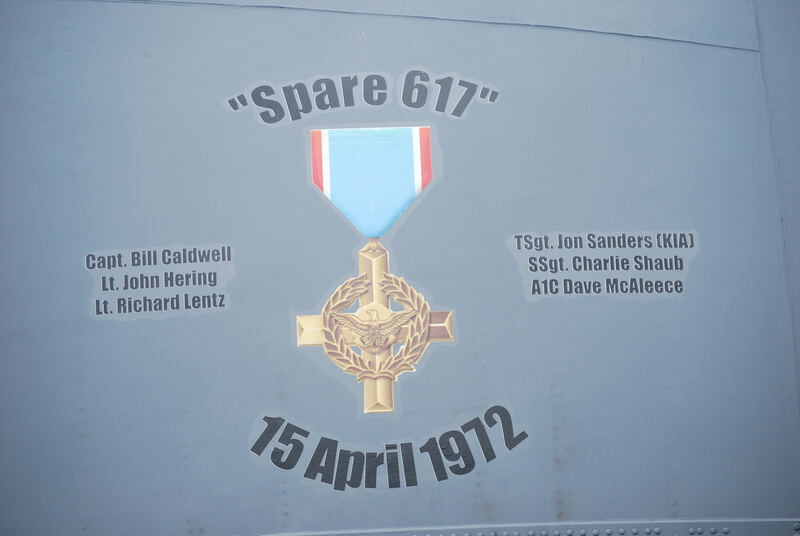 The third airplane in the formation was SPARE 617, commanded by Captain William R. Caldwell of the 776th Tactical Airlift Squadron. His crewmembers included Lt. John Hering, copilot, Lt. Richard Lentz, navigator, TSgt. Jon Sanders, engineer and SSgt Charles L. Shaub and A1C David McAleece, loadmasters. Caldwell had just returned from leave and had just arrived at Tan Son Nhut two days before. The first C-130 crew dropped their load and pulled away from the drop zone without serious damage but the second crew had a malfunction with their load and were unable to drop. By the time Caldwell began his approach, he was aware that the enemy gunners were on full alert and waiting for him. Just as they released their load, the airplane was hit by a hail of .51-caliber fire. At least 87 rounds hit the left side of the airplane. TSgt Sanders was killed instantly by a round that came through the side of the airplane and the navigator was wounded by flying debris and shrapnel, as was Airman McAleece. A bleed air duct in the cargo compartment was ruptered by the ground fire and 700 degree air poured into the cargo compartment. Two pallets caught fire and exploded just after they left the airplane but the rest of the load landed on the drop zone. The hot air had set the cargo compartment insulation on fire and had heated the metal fire extinguished until it was red hot. SSgt. Shaub nevertheless took up the fire extinguisher - while badly burning his hands in the process - and put out the fire. He then went up into the cockpit and told the navigator to open the two side windows while he removed the overhead escape hatch to clear the smoke out of the airplane. Suddently fire warning lights came on for the two left hand engine, and the two pilots and the navigator worked quickly to shut them down. As it turned out, there was nothing wrong with the engines but the other two engines had both been hit by a dozen rounds each of .51-caliber machinegun fire. Caldwell's first thoughts were to find a place to put the airplane on the ground. He had lost two engines and the airplane was in bad shape, but he decided to try to nurse it back to Tan Son Nhut. There were no hydraulics to operate the landing gear so it would have to be cranked down. At first, it wouldn't come down because the pilots had failed to pull the circuit breakers when they ran the emergency gear extension checklist. The navigator caught the error, which would have no doubt been caught by the engineer had he been alive, and the crew ran the checklist again. When the circuit breakers were pulled, the loadmasters were able to get the gear to extend using the cranking mechanism. Shaub's hands were badly burned, but he and McAleece were able to get the gear down just before the airplane touched down - miraculously after nearly losing a third engine when it rolled back to 30% power. Fortunately, it came back up as Caldwell turned the airplane onto the final approach leg. Charlie Shaub was nominated for the Medal of Honor for his role in saving the airplane, but for some reason, the recommendation was downgraded to an Air Force Cross. Caldwell also recieved the Air Force Cross. Shaub was also honored by the Air Force Sergeants Association with the William Pitsenbarger Award for 1972. 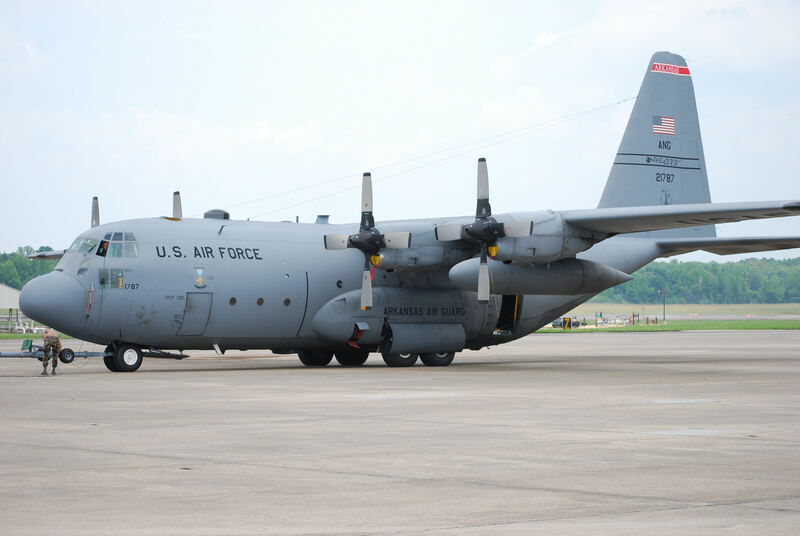 The airplane, C-130E 62-1787, was repaired and returned to service. It eventually returned to the United States to the 314th Tactical Airlift Wing at Little Rock, Arkansas, then served with several Air National Guard squadrons. It was assigned to the Arkansas Air Guard at Little Rock at the time it was identified for the US Air Force Museum but returned to the active Air Force before it was retired. It was delivered to the museum on August 18, 2011.